Estella Blanche Osborn, daughter of William Nelson Osborn and Hannah Britt, was born Aug. 18, 1880 near Clarinda, Page Co., Iowa and died April 8, 1932 near Gravity, Taylor Co., Iowa. 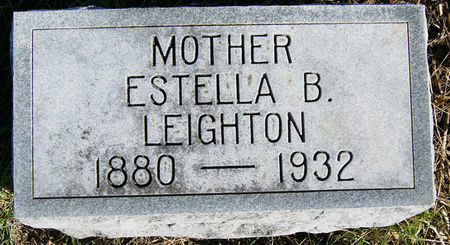 She married Alba Jacob Leighton Dec. 29, 1898 at Clarinda, Page Co., Iowa. Source of marriage date: Iowa,County Marriages, 1838-1934. His obituary gives the marriage date as Dec. 29, 1896. Searching for ESTELLA BLANCHE LEIGHTON in Taylor County Iowa?